Grizzly Sports connected 2-time NBA champion (1991 and 1992 Chicago Bulls) Cliff Levingston with Eckrich, grocer Strack & Van Til and Operation Homefront, a national nonprofit whose mission is to build strong, stable, and secure military families, to honor a Shorewood, Ill. military family on June 30. 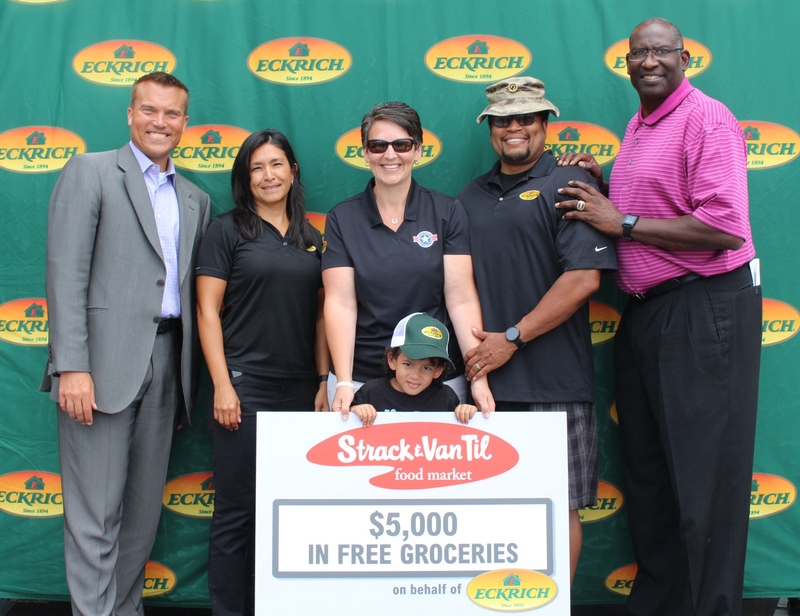 Eckrich hosted a special presentation, featuring Levingston at a Strack & Van Til store in Schererville, Ind. to honor, thank and support the Sanders family. Levingston helped surprise the family with a gift of $5,000 in free groceries at Strack & Van Til, courtesy of Eckrich. Brandon Sanders was a First Lieutenant in the US Army, serving for 18 years. He was deployed in the Persian Gulf War and in support of Operation Iraqi Freedom. He now runs a non-profit organization, The Rally Point Program, which helps at-risk youth by providing them with positive experiences and role models. His wife, Courtney, is his caregiver and a member of Operation Homefront’s Hearts of Valor program. The family has four children. Grizzly’s work with Eckrich, Strack Van Til and Operation Homefront was made possible through partnership with InterSport.